The Media Freedoms Committee at the Syrian Journalists' Association said Friday that 15 journalists were killed in March in Syria. Media Freedoms Committee at the Syrian Journalists' Association noted that 10 journalists in the suburbs of capital Damascus, 3 in Daraa and 2 in Homs so in total of 15 killed in March in Syria. 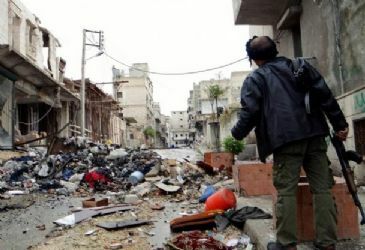 The Committee said that the total number of journalists killed in the clashes in Syria since March 15, 2011 rose to 153. Names of the journalists who were killed in the clashes between the Free Syrian Army and Assad forces in March are "Waleed Jamil Amira, Mohammed Bashir Shkhshiro, Saqr Abu Nabot, Ghaith Abdul-Jawad, Amer Badr al-Din Junaid, Osama Abdel Basset Altaleb, Ahmed Khaled Shehadeh, Anas al-Batsh, Mahmoud Alnatouf, Mahmoud Abdul-Karim al-Aqraa, Laith Mohammed al-Homsi, Hamed Abu Yasser, Mohammed Ibrahim Alaasmi, Amer Diab and Walid Khaled Aljalkh."